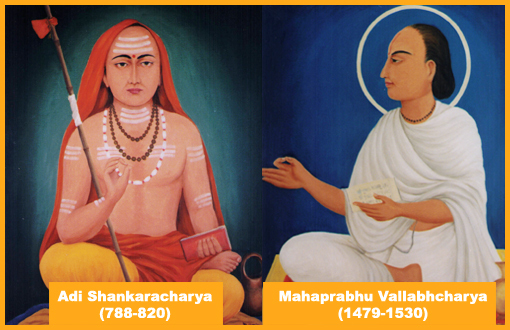 The existence of vedic dharma in india today is due to shankaracharya. He single-handed overpowered very powerful & numerous forces opposed to vedic religion and restored the Vedic Dharma and Advaita Vedanta to its pristine purity in the land using the weapon of pure knowledge & spirituality. Shankaracharya wrote Bhashyas or commentaries on the brahma sutras, the upanishads and the gita for learning logic and metaphysion and his works such as viveka chudamane, Atma Bodha, Aparoksha Anubhuti, Ananda Lahavi, Atma-Anatma Viveka, Drik-Drishya Viveka and upadesa sahasri for gamming practical knowledge, which unfolds and strengthens devotion. Vallabhachrya, the founder of the vaishnvite culture a contemporary of shri chaitanya Mahaprabhu. His important works are vyasa sutra Bhashya, Jaimine Sutra Bhashya, Bhagvata Tika Subodhini, Pushti Pravala Maryada and Siddhanta Rahasya, all in sanskrit, but he has also written many books in bring bhasha. Vallabhcharya laid great stren on pushti (race) and bhakti (devotion).